I love anything to do with jalapeno poppers. I’m also a sucker for cheese bread. So this was a marriage of the utmost happiest for my taste buds. Preheat the oven to 400 degrees. Line a large baking sheet with parchment paper. Cut the bread lengthwise and place both parts face up on the sheet. Brush both pieces with melted butter. Sprinkle with garlic powder. Cover with a piece of aluminum foil and place in the oven. Bake for 5 minutes. In the meantime, divide the jalapenos. Save the pretty slices to place on top of the bread (About 1/4 cup). Chop the rest. In a medium mixing bowl, mix together cream cheese, sour cream, mayo, chopped jalapenos, parmesan, salt and pepper. Remove the bread from the oven and uncover. Spread the jalapeno dip mixture on the bread. 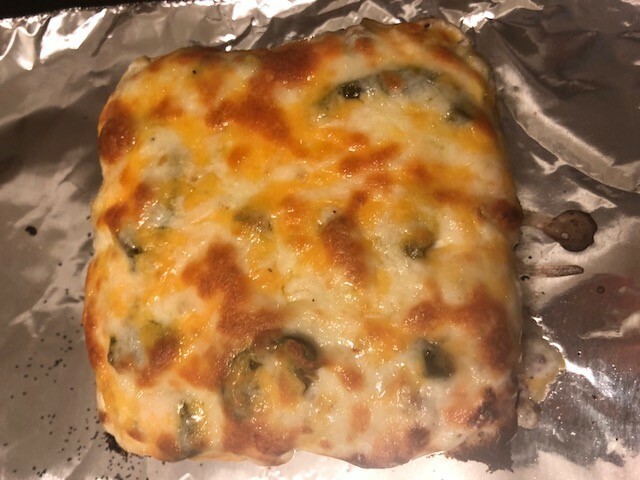 Top with remaining jalapenos and the shredded cheese. Bake for 5 more minutes or until cheese begins turning golden brown.